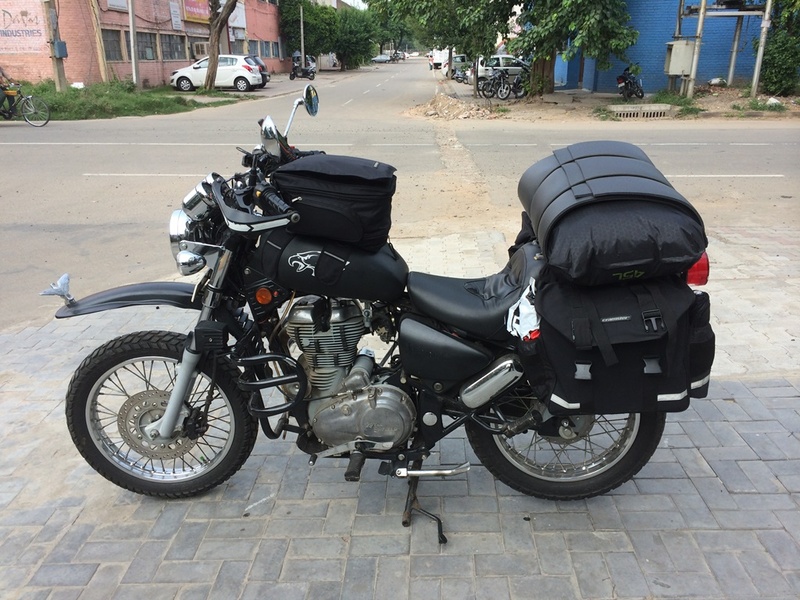 After reading about my Marsimik La Adventure, someone wanted to know what modifications I had done to my Royal Enfield Thunderbird 350 to ready it for long rides in the Himalayas. This post is meant to answer that question. If you are riding the Himalayas the first thing you need to do is replace your tyres. The stock tyres are meant for riding on tarmac and most Himalayan roads are almost like off-road trails with intermittent patches of tarmac. I replaced my front stock tire with a Pirelli MT60 19 inch. It’s got a create grip off-road and works well on tarmac as well. My Thunderbird came with a 19 inch rear rim. I changed that to an 18 inch rim so that I would get a better variety of rear tyres to choose from. For the rear tyre I picked the 120mm wide Ceat Vertigo Sport 18 inch. Both my tyres have tubes and before leaving for the Himalayas I made it a point to fill the tubes with Puncture Lock sealant. The Thunderbird is meant to be a cruiser and has a seat like one but it was not to my liking. I needed lower lumbar support for my back and replaced the stock seat with this amazing seat from Royal Enfield Zone. The back rests are pointless because they rattle at high speeds. So I threw them away. IMHO the handlebar of the Thunderbird is a travesty. Seems to me that whoever at Royal Enfield designed it doesn’t have a clue about long distance riding. The stock handlebar works fine when you are riding in city or a short ride. But after riding for 100 kms or so your elbows bend and your back tends to slouch due to the way the ends of the handlebar point towards the ground. Your back hurts and you end up getting a neck ache as well due to the slouch. One bad road bump and our back and neck see stars. I also have a Harley-Davidson Fat Boy, a proper cruiser and the handlebar is designed in a way that you can go hundreds of miles without much fatigue. The ends of the handlebar point outward resulting in your back staying upright. I replaced my stock handlebar with this one from Royal Enfield Zone and welded a cross pipe along the top for added strength. The cross pipe also served to hold my GPS and cigarette lighter from which I used to continuously charge the remote of my GoPro camera. Everything else I added or modified on the motorcycle was merely cosmetic. For example, I replaced the front and rear mudguards with those of dirk bikes. I fabricated a custom rear bracket to hold the tail light assembly. Since I do a lot of night riding I added a couple of LED pods on the crash guard which basically make my motorcycle a light house on wheels.